She spent her life fighting for middle ground, and now that she’s found it, she’ll fight for her life. Ember Brooks yearns for an end to the dark chapters of her life—abusive mother, negligent father, teenage trauma, and sibling suicide. Determined to escape her traumatic past, Ember is finally headed for solid ground, gathering strength and balance with the help of her trusted counselor and friend, Xander Kane. Still reeling from the death of her brother, Ember finds solace when Manchester Marauders center, Owen Killion goes on the offensive and barrels into her life. Both on the football field and off, Owen is sure-footed and confident. With his domineering presence and reliable nature, he alters her game-plan. But for a girl continually left on the sidelines, can she leave her heart on the line? When Ember is the victim of increasingly dangerous incidents, and Xander changes the course of their relationship, once more her life spirals out of control. Ember trusts Owen to guard their love, but when someone else is calling the shots, can they reach the end zone or will they fumble? These Links are associated with the author. In the spring of 2013, Jillian Jacobs changed her career path and became a romance writer. After reading for years, she figured writing a romance would be quick and easy. Nope! With the guidance of the Indiana Romance Writers of America chapter, she’s learned there are many “rules” to writing a proper romance. Being re-schooled has been an interesting journey, and she hopes the best trails are yet to be traveled. Water’s Threshold, the first in Jillian’s Elementals series, was a finalist in Chicago-North’s 2014 Fire and Ice contest in the Women’s Fiction category. Jillian is a: Tea Guzzler, Polish Pottery Hoarder, and lover of all things Moose. 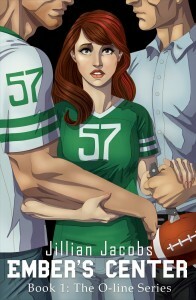 This entry was posted in BLOG TOUR, Romance Contemporary, Romance Sporty and tagged Jillian Jacobs. Bookmark the permalink. Thanks for hosting Ember’s Center today.